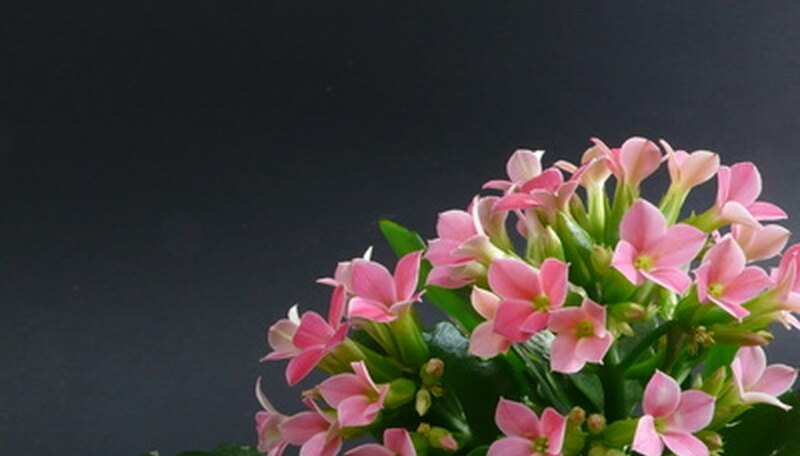 You'll find kalanchoe (Kalanchoe blossfeldiana), a brightly colored houseplant, for sale during the late winter and early spring. This popular potted succulent needs very little attention. Its dark-green, scalloped, waxy leaves set off clusters of small flowers in a range of colors. The kalanchoe originally is from Madagascar. It prefers full sun (though it will tolerate bright light) and a well-drained potting soil. Because kalanchoe is a succulent, water only when the soil is dry to the touch. Too much water will rot the plant. Kalanchoe can grow in USDA hardiness zones 10 and 11, but anywhere cooler it must remain a houseplant. Red kalanchoe varieties include Arjuno (red), Kawi (rose red), Nemo (dark red) and Zion (orange red). Magenta varieties include Pellinore (fuchsia), Mount Rushmore (purple pink) and Bromo (violet). Orange varieties include Carmen (orange), Klabat (orange with a yellow eye), Patty (orange pink) and Zion (orange red). Pink varieties include Brava (pink), Keruna (light pink), Nadia (salmon) and Shasta (light pink). Yellow varieties include Beta (yellow), Riet (golden yellow), Runa (yellow), Milos (yellow-orange), and Yellow Josefine (yellow). White varieties include Sig, Simone and Snowdon.